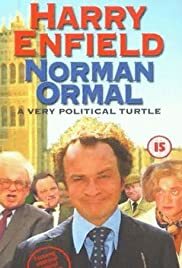 A guide to Norman Ormal: A Very Political Turtle, the 1998 BBC One TV sketch show. The comic life and times of an unlikely politician, starring the many faces of Harry Enfield. `Norman Ormal ... ` is a broad satire on British politics during the years of the Thatcher Conservative government of the nineteen eighties. English comedian Harry Enfield in a series of deliberately bad wigs impersonates many cabinet ministers of the time. One well-known female politician (and author) is renamed Edwina Slagg - perceptive in the light of recent major revelations! This hour-long spoof documentary is basically a showcase for Enfield's cleverness and I found it very funny. A knowledge of recent British political events would be most helpful but lines like `Loyalty has always been my greatest weakness' should strike a chord in any parliamentary democracy.